Steel frame looks similar to our flangship EB-636, however the range will be shorter as the 36v battery has less Ah. For many people its 8 mile range is enough for the ebike needs around camp, in town, or other needs. We have reduced the price and some features many don't need on this bike. It comes standard with high tensile folding steel frame like picture on the right. 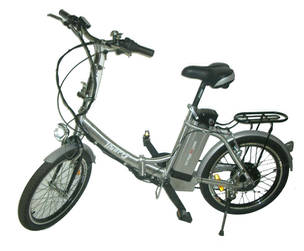 It has single speed for pedaling, an efficient 250 watt motor and you can choose to either pedal or use the throttle, or even do both at one time. It does not have pedal assist, a some do not desire this feature Charging time is 6-8 hours on the LiFePO4 battery which has longer life than another battery on the market. This bike folds up into a small area and weighs 49 pounds with the battery (only 5 pounds) for the high tech LiFePO4 battery and you still have a very lightweight motorized bike, that you can take in an elevator, fold beside your desk, or place in your dorm room. MORE POWERFUL with tons of features! Take a look at the stylish design. 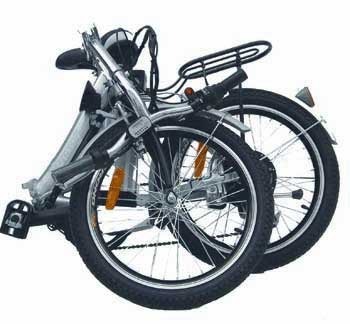 People choose and love our folding bikes for a variety on reasons, one of them is it's neat, trim, stylish appearance, but ultimately they like the folding bikes because of their convenience and compact size. It folds in the frame as well as on the handlebar stem, into a very small package. This bike folds up into a small area and weighs less than 49 pounds without the battery. Add only 9 pounds (4 kg) for the lightweight Li-ion battery and you still have a very lightweight motorized bike, that you can take in an elevator, fold beside your desk, or place in your dorm room. When you look at features, there are a variety of things to consider. One of the first features will be safety. This is where our folding bike shines. You love that your electric bike will power you up the hill, but what about safety when you are hurling down that mountain? With the six speed derailleur you are not limited to the speed of the electric motor, you can speed down the road as fast you can in high gear! You get the best of both worlds! Exercise and electric assist. These are much lighter than the standard lead/acid or Ni-MH battery. You get longer life of up to 500 reharges compared to NiMH (300-400 charges) or the lead/acid batteries (200-300 charges).